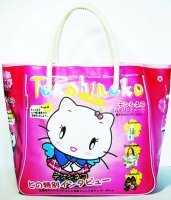 Tenshi Neko Kawaii Schoolgirl Tote Bag , Tote Bags , Bags : Starscastle Online Shop: Cute Bags, Accessories, Kawaii Stationery, Cool Wallets, Fashion Jewelry & More! Great bag for any occasion - work, school, or vacation. Lots of space to put all your essentials. 1 inner side pocket. Inner bag fully lined.